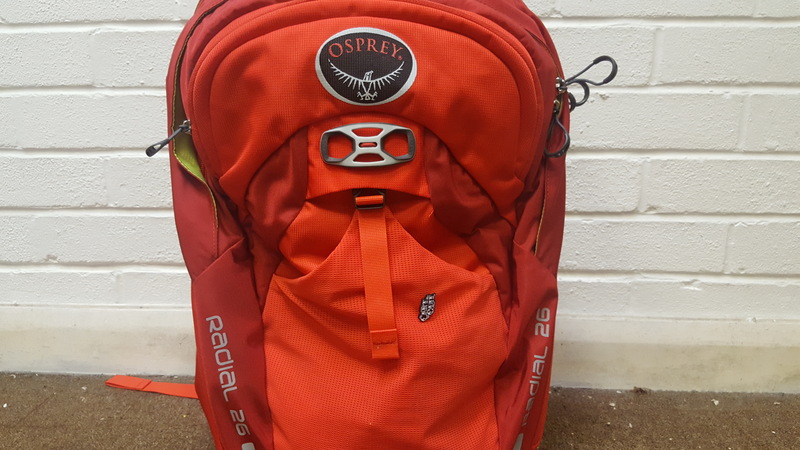 One thing you can rely on with an Osprey pack is a LOT of features. Quite often a backpack will have straps, a main compartment, a smaller compartment and maybe a couple of mesh pockets for bits, bobs and gubbins. But this latest pack from Osprey – aimed at commuting – has a few more bells and whistles. In fact, it has actually got a whistle! One of the most interesting features of the Radial is the ‘integrated kick stand’, which isn’t a kick stand at all. You don’t ‘kick’ it to use it but it’s a metal frame that extends all the way around the pack. There’s a slightly-flexible ‘leg’ that sticks out from the metal frame to provide stability. The whole thing admittedly adds some weight but allows you to place the bag on the floor and it stands up on its own. Like magic. Many sections for your stuff. Before the pack arrived for this test I was intrigued, but thought it sounded a bit pointless and gimmicky. However, the very first time I rode to work with the pack and unloaded it without having to lean it against the wall I was completely sold on the idea. It’s great! 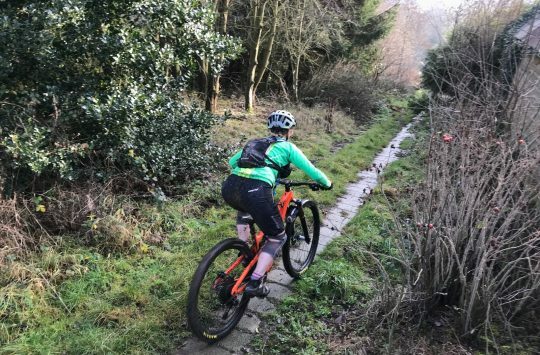 You just plonk it down and it’s so much easier to get your stuff in and out without worrying about it falling over and breaking your laptop or morning biscuits. This isn’t a solution to a problem that didn’t exist, but a nifty innovation that you’ll very quickly learn to love. 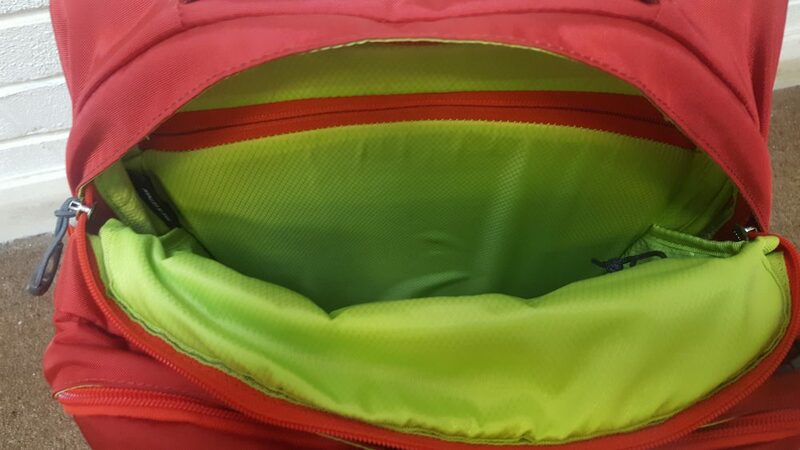 The main compartment is designed for a notebook computer and a tablet in a separate zipped compartment. It’s all nicely padded inside and big enough for a 43x25cm laptop. 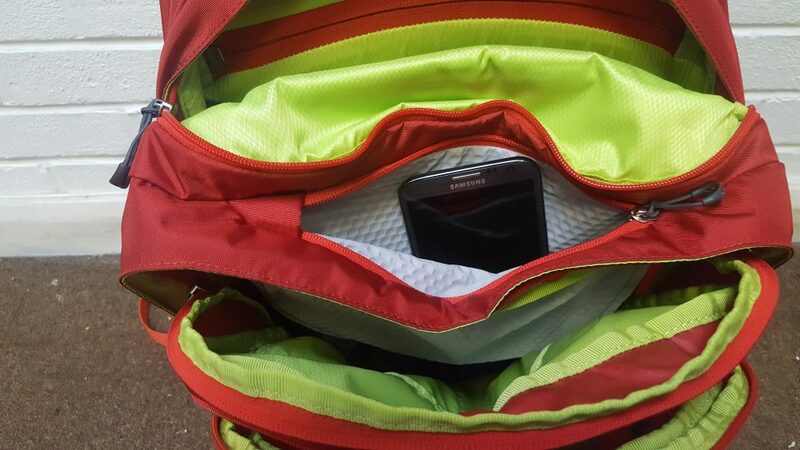 Next to that there’s a small zipped compartment on the top of the pack that’s padded and ideal for a mobile phone, sunglasses or anything else small and expensive that you don’t want to get scratched. 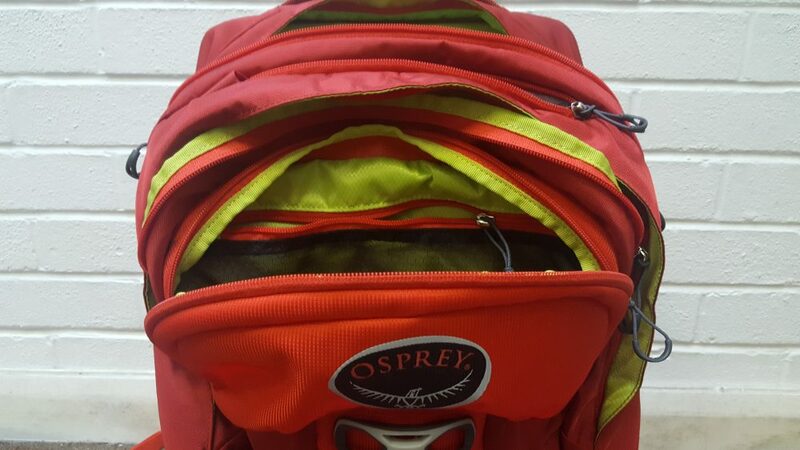 Another zip gives access to a large organiser compartment comprising various pockets, nooks and crannies for pens, pencils, rulers, newspapers, sandwiches, a bag of wotsits – you get the drift. 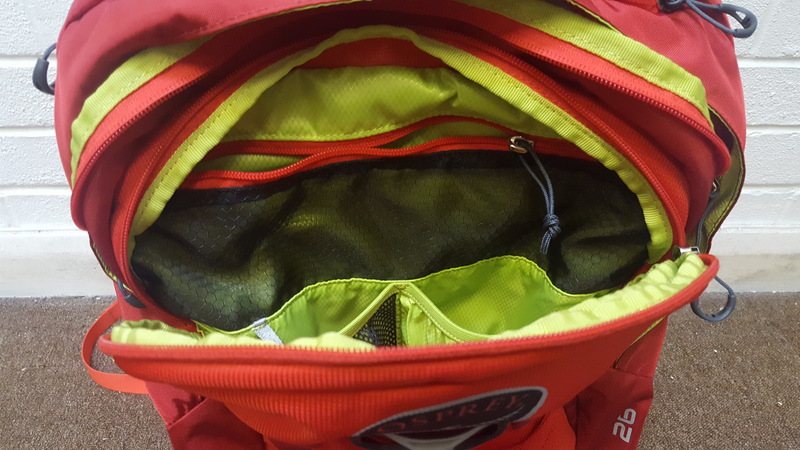 The front pocket is accessed via yet another zip – I found this pocket handy for tools and a spare tube. 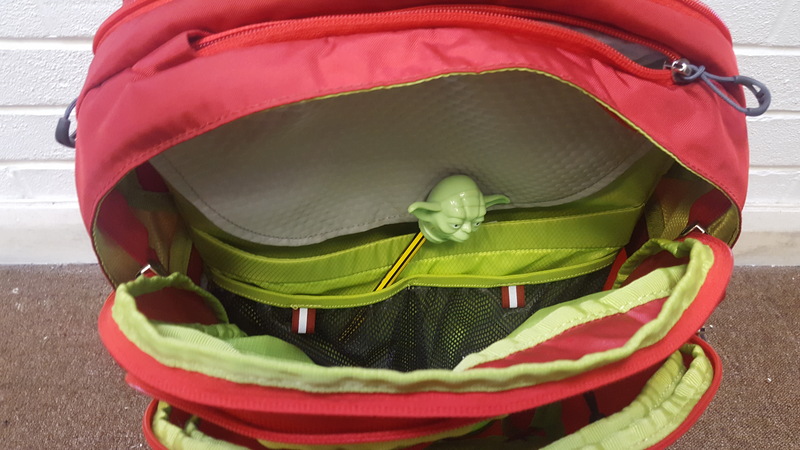 I also noticed a pen pocket, so I quickly moved my pens and pencils into that one. Phew. Pocket for things you don’t want scratched. On the outside of the Radial 26 there’s a stretchy front pocket for a rolled-up jacket, and you’ll also find a pocket on each side, one zipped (with a handy key clip on an extending cord) and one for a can of beer. Or a water bottle if that’s more your style. Personally, I know what I need to get me through a day at work. An elasticated clip on the front of the pack is there to carry your helmet (handy for train journeys) and there’s a hidden rain cover to stop your VHS collection and homemade parkin from getting wet. Handy helmet strap for train goers. 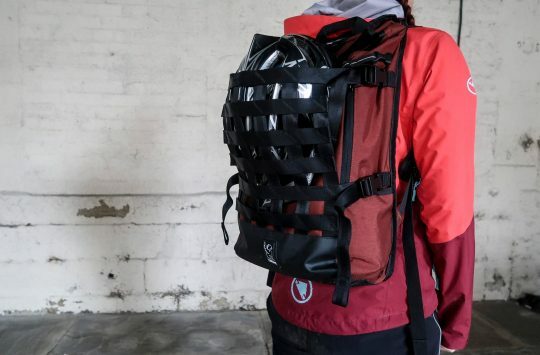 The Radial has a mesh back system that’s a bit like having a trampoline between your back and the bag, but it’s way less fun than I’ve just made it out to be. This fun-neutral trampoline very effectively lifts the pack away from your body and allows air to flow through, keeping you cool like a Barry White that doesn’t sweat so much. Actually, that’s a terrible metaphor. What I mean is, meh, forget it. It basically stops your back from sweating. And this is probably important if you work near other people and/or you don’t have a shower at work. More pockets to organise your tools, or sandwiches. It works well to channel the airflow, however if the bag was fully-loaded the mesh could at times feel quite abrasive if I wore it with a single layer of clothing. Kind of like an unintentional exfoliation session. 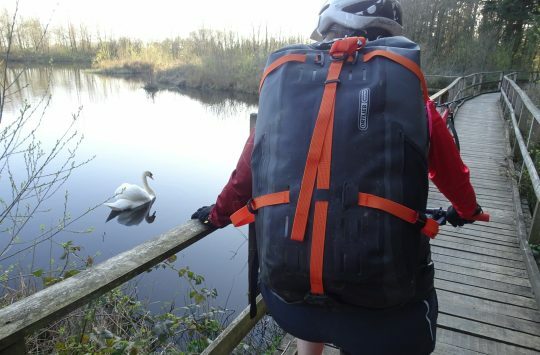 The shoulder straps themselves are wide and heavily padded, and they feature a nifty elastic suspension system that distributes the load really well. Even with the pack loaded to the hilt with cans of beer, I didn’t feel like there were any hot-spots or pressure points. Oh, and the sternum strap clasp has a built-in whistle for those times when you find yourself accidentally refereeing a football match. 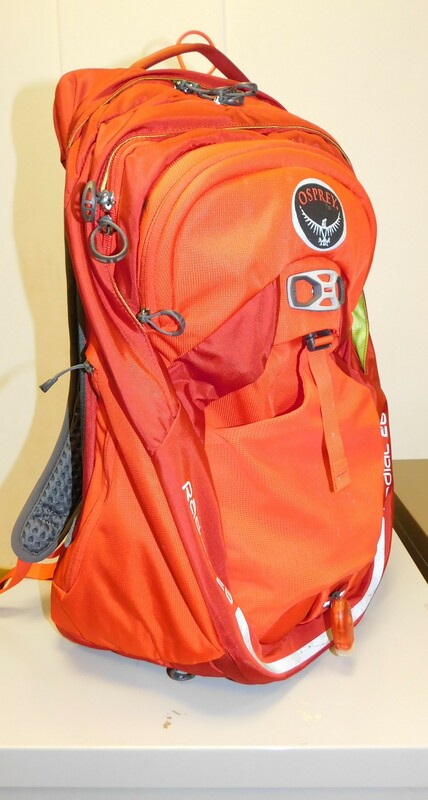 Thanks Osprey! Space for your pencils, if you’re not yet ready for pens. I found the Radial 26 to be more than big enough for my laptop, spare clothes and work stuff, but if you carry A LOT of stuff then there’s a larger Radial 34 which is a bit bigger and only slightly more expensive. 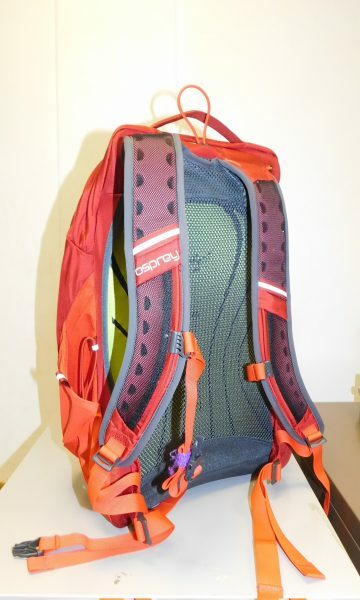 At first glance £110 seems a lot to ask for a commuting backpack, but I’ve not seen many backpacks with as many features as this. Not only that but it’s incredibly well-made and has an attention to detail that made me smile at times, especially the kickstand feature which makes me go “ooooo that’s cool”, every time, without fail. My work colleagues? Not so much. You need to watch out that you don’t overload it too badly to get the best from the mesh back system but really, apart from that, I can’t fault it.